The production shot in the stunning Liwa desert and purpose-built sets that replicated an oilfield in the 1970s were situated at Al Wathba and Al Ain. The production also made use of twofour54’s award-winning backlot at KIZAD, where they created an Arabian marketplace. The international crew of more than 200 included twofour54 professionals who provided full production services, covering key areas such as location assistance, permits and equipment as well as catering, accommodation, travel and transportation. The crew for the shoot consisted of talent from India, Syria, Germany, Yemen and the UAE. Due to release in cinemas during Eid Al Fitr 2019, ‘Bharat’ is an official adaptation of the 2014 Korean film, ‘Ode to My Father’, which depicted modern Korean history from the 1950’s to the present day through the life of an ordinary man. The movie is being produced by Reel Life Production Pvt, which is owned by Salman Khan’s sister, Alvira Khan Agnihotri, and brother-in-law, Atul Agnihotri. The cast also includes veteran star Jackie Shroff, Sunil Grover and dancer, model and actress Nora Fatehi. 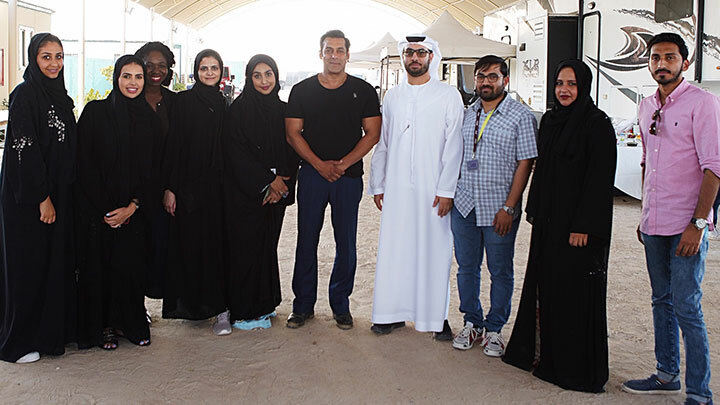 ‘Bharat’ is the seventh major Indian movie to be shot in Abu Dhabi, and the third this year alone. ‘Race 3’ was shot earlier in the year as well as, ‘Saaho’, which features Prabhas, which also filmed in the Emirate. Other major productions in Abu Dhabi this year include Paramount Pictures’ ‘Mission: Impossible – Fallout’, which saw Hollywood legend Tom Cruise leap from 20,000ft in the Emirate’s sky for the daredevil HALO parachute jump.